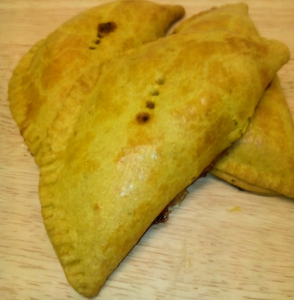 You probably have tasted Jamaican Patties if not why not? They are a tasty snack to eat on the go or pop into your lunch box. This recipe is the one developed over the years at my Cafe in Gosport UK. My customers loved them and were always wanting the recipe, well here it is. This recipe will make 54 Patties they freeze well so why not spoil yourself and make a batch. In a food processor add the Flour, Turmeric and Salt and whiz for 30 seconds to mix it up then while running add all the fats in chunks, when all mixed and breadcrumb like add the water a tablespoon at a time. add 4 then wait if the dough does not come together slowly pour in the rest till the dough clumps and starts to form a ball. Take out of your processor wrap in cling film and pop into the fridge for at least 30 mins before you make your patties. Fry the onion till nice and brown, use a low heat, it takes about 10 mins to get them nice and brown at this stage add the salt, pepper, sugar and all the seeds. Now you have a nice brown mixture add the Beef and tinned veg stir in well cook until nice and brown. Add the Curry Powder and diced Chilli stir in well give it about five mins then add the breadcrumbs mix well, add the stock and Worcester Sauce, mix well and leave to simmer on a low heat for 20 mins, stirring every so often so it does not stick. Leave to cool. I gave you the Pastry makings for 6 Patties you can just do 6 or make all the Pastry now and either use the Patties for a Party or make and freeze them for later. The filling will freeze well for later also. So take your pastry and roll it into 5 balls roll out each ball and cut to a six-inch circle (use a plate the right size or get a 6inch pastry cutter if you can find one) I use a Pasty mould you can get from eBay (buy the best one you can some are very flimsy and won’t last the distance) if you are lucky some of them can be used to cut the Pastry. Flour a work surface and roll out your 5 balls cut to 6-inch circle, then using the trimmings make the 6th ball and roll out. Flour your pastry mold, lay your circle of pastry and add a good dessert spoon of filling, brush the edges with egg wash and form the patties, you may have to squash the edges to get a good seal. Grease a baking tray big enough to fit 6 Patties with at least 12 mm around the Patties brush with egg wash, then cook for around 40 mins, Take out of your oven and leave to cool.